Glad I got that off my chest. Now for the longer version. My theory about a weasel turned out to be tragically (for the chickens) wrong. We spent Friday afternoon closing gaps around the door into the chicken yard, but still had a dead chicken on Saturday. So I figured it had to be a weasel or some similar critter that can squeeze through 2 x 4 inch openings in the fencing. 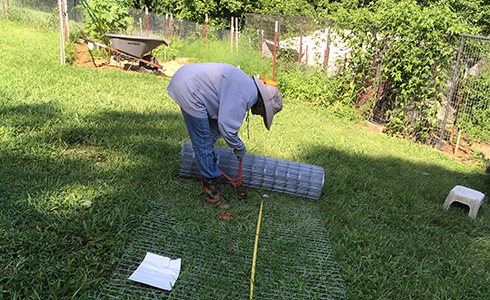 We spent Saturday covering those openings with chicken wire. 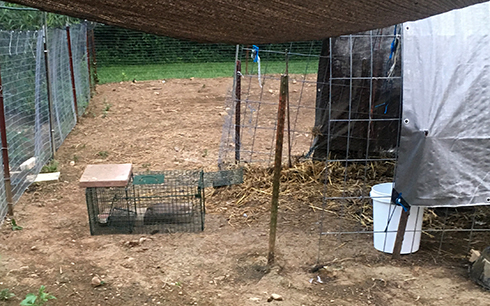 I also set a trap outside the fences, figuring the weasel would find he couldn’t get into the chicken yard and go for the bait. I went out Sunday morning to check. Nothing in the trap. Well, okay, maybe Mr. Weasel finally gave up. Okay, I said to myself, there’s no way some critter burrowed into this Fort Knox chicken yard without leaving evidence of the break-in, so what the …? After I finished sharing my expansive vocabulary with the nearby trees and wildlife, I remembered some bank-heist movie I saw years ago. The cops were going batty trying to figure out how a master thief had escaped the bank. They couldn’t find the route. The punchline was that he’d never left. He was simply hiding inside the bank and waiting for the investigators to give up and leave. Son of a …. we’ve been trying to keep a critter out, but the critter is already in. It probably burrowed its way under one of the wooden pallets in the coop and set up living quarters. Not a weasel. Another @#$%ing raccoon. Now it all made sense. I was mystified as to why the electric fence surrounding the coop wasn’t discouraging the chicken-killer. The fence hadn’t been disturbed, so I had visions of a critter either squeezing through and taking the shocks or jumping over it. Nope. The critter didn’t care about the electric fence because he was already inside the coop, living in a basement apartment and coming up at night for water, chicken feed for an appetizer, and a fresh chicken for the main course — all provided free of charge by us. 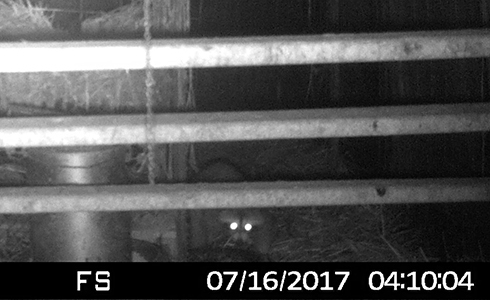 It also explains why the predator never wandered into my trap, which I’d set outside the electric fence. His dinners were inside the electric fence, and so was he. I imagined two scenarios if we lifted the pallets and exposed Rocky Raccoon’s den: 1) he attempts to run to the fence and dig his way out while I blow him apart with a shotgun, or 2) he charges and attempts to bite me while I try to blow him apart with a shotgun without blowing my own foot off with a shotgun. Being the sensible sort, Chareva suggested a third option. She’s been planning to move the surviving chickens to fresh ground anyway. 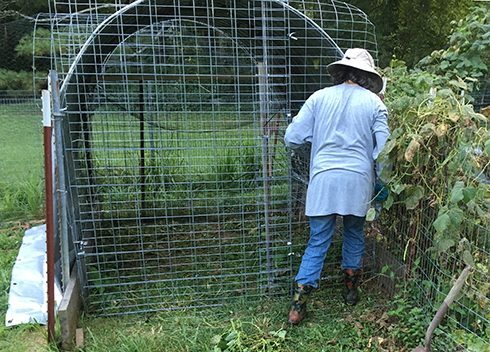 She pointed out that to avoid an up-close-and-personal showdown with the raccoon, all we’d have to do is build the new chicken coop in one day and move the chickens. Nothing to it. So that was our Sunday. 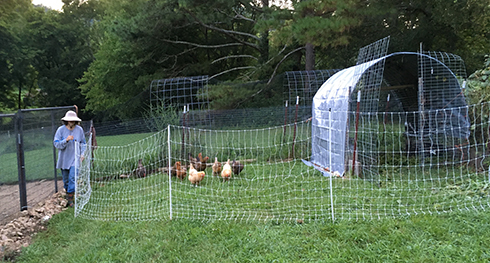 We’ll eventually want a whole new chicken yard, complete with nets overhead, so we stocked up on materials at Tractor Supply and Home Depot. We plan to double the height of the fences this time and string the nets 10 feet over our heads. But that’s later. Sunday’s goal was to build a secure coop. Fortunately, the shell was already in place. 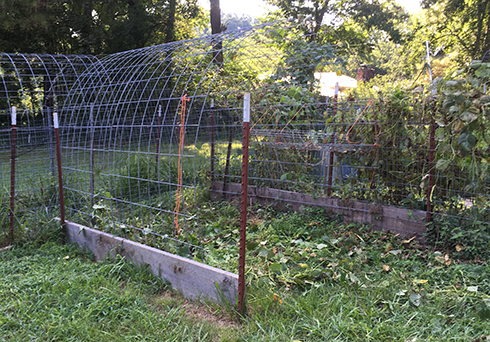 Back in the spring, Chareva had created an arch with cattle panels as a trellis for green beans. She intended all along for that arch to be converted to a new coop. The gaps in a cattle panel are too big to keep out predators, so the first task (after pulling down the beans) was to cover the entire structure with 1 x 2 inch fencing. Then we covered the whole thing with a tarp. When we do get around to building a new chicken-yard, it will have a door. In the meantime, we had to rig one for the coop itself. 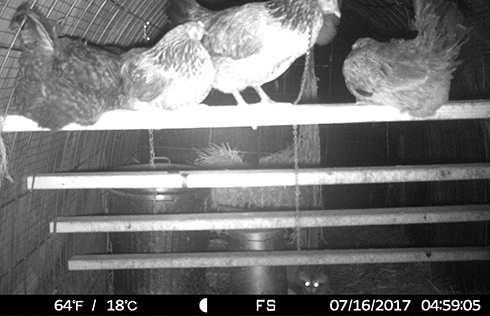 It’s not easy to see in the photo below, but Chareva also staked down some fencing in front of the coop to discourage predators from burrowing under the door. I cut 2 x 4 planks and attached braces on the ends for roosting perches. 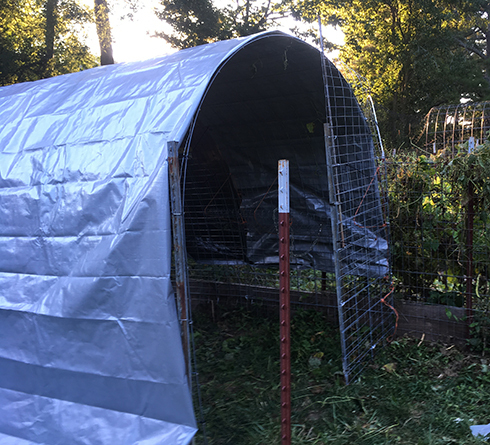 With that done, the last task was to move the chickens out of the yard that now features a basement apartment occupied by a nasty tenant. 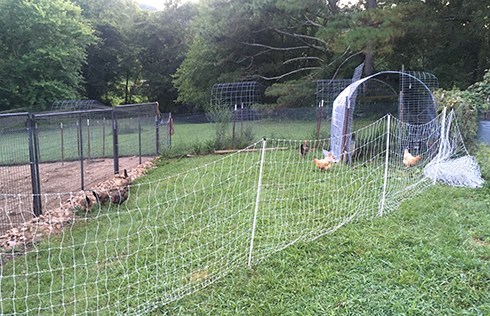 Since the electric fence is portable, we positioned it between the chicken yard and new coop and let the chickens wander, then moved the fence closer and closer to the new coop. I counted the surviving chickens. There are only nine, which means we lost 15 from that flock. Good grief. 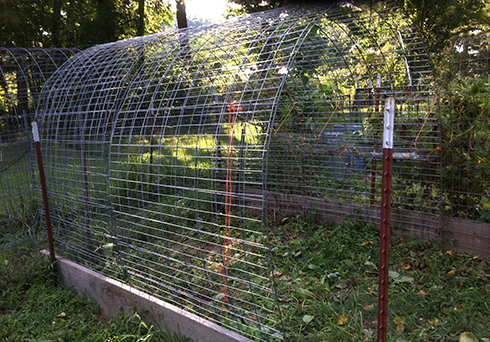 Thanks to all the reinforcing of the chicken yard, Rocky Raccoon VI is probably locked in there now. With the chicken dinners gone, he’s bound to get hungry in the next day or two. 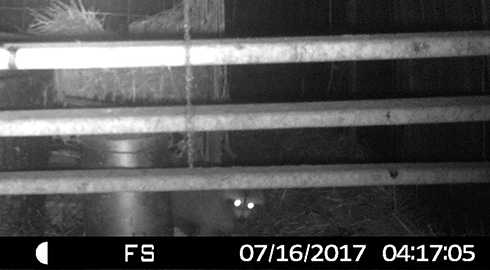 So I set out what I hope is his last meal – a can of cat food in the trap, with no electric fence to discourage him from going for the bait. I was a lousy babysitter for those chickens. It could be that descendants of raccoons will be our successor species. They already have hands, and have learned to pick locks and we have put intense selection pressure on raccoons as they are becoming a city and suburban species and the best we can do is not sufficient to keep them out of our garbage. Give evolution a few hundred years, and raccoons will be opening chicken franchises. One living in deep-cover status. Can you really blame the raccoon? I’d probably do the same thing if I was a raccoon. Now i’m in suspense whether he goes for the trap or not! The raccoon was doing what comes naturally, which is to kill and eat chickens. When I get the chance, I’ll do what comes naturally, which is to shoot the predator that killed off most of our chickens. Perhaps you could convince the raccoon to become vegan..
Are you curious to know if racoon tastes like chicken or have you yet to go full Jed Clampett on us? We went full Clampett with a previous chicken-killer. Raccoon tastes like beef. I remember that. I thought it was possum. My memory is turning to Swiss Cheese. 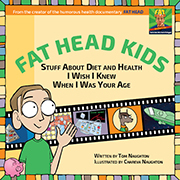 Thankfully, that is a low carb food. Possums are too friggin’ ugly to consider eating. 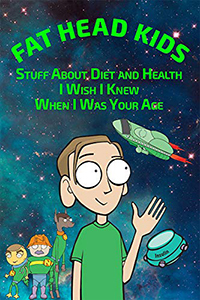 All these smart people reading the saga – many of us, I’m sure, love whodunnits – and none of us came up with this. I hope the rest of you are as embarrassed as I am. Well, Valerie asked in comments if perhaps the predator was living in the chicken-yard somewhere. She probably guesses correctly who the killer is in murder-mystery novels as well. Probably a world champion Clue player. For stringing bird nets up high over my raspberries. I put an ad in Craigslist looking for old portable carport frames with no tarp for free, I picked up 6 in a couple weeks. Assemble the frame 10’x20’x8’tall over the area, tape off all snags on the top of the frame so the netting doesn’t catch and pull the netting or whatever over the frames. The frames last for years and are portable with 4 people, one at each corner. Portable carport frames … now that’s one that wouldn’t have occurred to me. Shame that raccoons aren’t worth eating. After all, you’ve been feeding the interloper, so it would be nice to get some economic benefit. We did eat one. Not bad, actually. We moved up here from the D/FW area of Texas last fall. I put out deer corn for the resident deer here on the outskirts of Tulsa, OK. We have twin fawns! But maybe it’s too soon to tell you how cute the baby raccoons were when eating the deer corn yesterday evening? Anyway, glad you found the culprit before you lost all your flock. And no, I don’t blame you one bit for putting him down. After all, he had a good run!!! I have no problem believing baby raccoons are cute. Heck, adult raccoons are kind of cute. Too bad they’re such prodigious killers. Looks like it evolved enough to use a head torch too. Baby raccoons purr like kittens. Very endearing. They also make excellent meat balls. Every time I come to see if there are any new replies I get a laugh from your meatballs comment. Thanks! 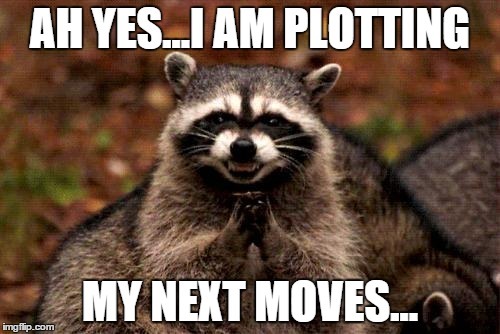 Did you catch the raccoon yet? Waiting with “baited” breath here…..
No evidence of him in the past two days. Also no evidence that he burrowed out of the chicken yard. Would love to know when Rocky Raccoon VI meets his demise…. He knocked over the big trap two days ago without getting caught. Haven’t seen evidence of him since, although I’ve got two arm traps baited. He may have died in there without us supplying him with water. Try setting out another trap just to make sure it’s not hiding? There are two arm traps inside the chicken yard. No takers yet. With 100 degree weather, I’m thinking you’ll know pretty quickly if it died on site. That’s why I haven’t declared him dead yet. Although if he’s burrowed deep below the coop, we may not sense the ripeness right away. Aren’t your dogs guarding the coop? Their yard is closer to the house. think polyface farming–move the dogs. and clearly you haven’t seen the film “phenomenon”. No, I haven’t seen that. We have plans to fence in the entire back of the property and let the dogs patrol back there. I understand the compassion, but the reality of the situation is that if he isn’t killed, he’ll keep coming back after the chickens. Raccoons being what they are (clever with thumbs), he’ll eventually find a way in and kill more of them. ok, I get that 🙁 I hope, against hope, that he manages to escape and never come back for the chickens again. We haven’t seen him, but also haven’t seen evidence he got out. As long as the chicken aren’t killed, I’m happy. Growing up possums used to kill our chickens. My mom killed one with a shovel one night when she looked up she saw eyes, took the shovel and beat it to death. That’s a brave mom. I find possums to be demonic-looking critters.